Apparently, the two self-proclaimed ‘top’ scientific journals, Nature and Science, have ended their hundreds of years-old feud and teamed up to launch a new journal, to be called either Scientific Nature or Natural Science, depending on the result of a text-message vote by the scientific community. Sounds good? Well, not really. We’re a bit upset that they’re also creating a social networking site called ‘Faculty of a Million’, funded by a grant from Facebook, where scientists can vote papers for acceptance by pressing a “Like” thumbs-up button or reject the paper by pressing a “Dislike” button. Our company lawyer has just had an apoplectic fit. readers will have the option of Skyping authors directly to share their thoughts and feelings about a paper simply by clicking that author’s name. As an added incentive, the first 100 new subscribers will get free genome scans. Posted in f1000, Friday afternoon, Literature, The Scientist | Comments Off on Faculty of a Million? 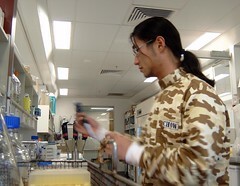 Let’s face it—despite the issues with care and maintenance and discomfort, if you work in a wet lab you have to wear a labcoat, as doing cell culture naked isn’t usually an option. So why not make them fashionable? Not everyone has the option of hanging onto their precious Howie report-style coat (pure cotton, elasticated cuffs, side-fastening; worn with the top stud rakishly undone) or even being able to get one in the first place. There are options. You could make your own, or get someone to make one for you. Or maybe, if you’re within pipetting distance of London, drop into the Bethnal Green Working Men’s Club (no, seriously) next Friday night for a pint of the good stuff and a science fashion show. Le Geek c’est Chic, apparently, and this is what happens when fashion designers meet science. Friday 19th March, Bethnal Green, London. The event is part of the National Science & Engineering week and is organized by the central London branch of the British Science Association. I’ll be the one in the hat. Still in London, don’t forget Geek Pop, next Thursday at The Miller, London Bridge. Tickets are £2 each and there’s more information on Facebook. There’s been a bit of a buzz about visualization recently, especially with Google weighing in with its Public Data Explorer (H/T RWW). You can make all sorts of lovely graphs and follow trends by time/and or geography, something that makes people like me look at our ~85,000 evaluations with a curious eye. In a similar vein, the Information is Beautiful site has a lovely rendering of the scientific evidence for the efficacy (or otherwise) of dietary supplements. The visualization is generated from a Google Docs spreadsheet that contains links to papers reporting the evidence on a particular supplement, which is very cool indeed. Particularly interesting (and possibly arbitrary) is the ‘Worth it line’; below which, presumably, you may as well pour money directly into the Armitage Shanks. You can change the display to show only the condition(s) you’re interested in, or the class of supplement (enzyme, mineral, vitamin etc.) Hover your mouse over one of the bubbles and watch it pop up with the condition the specific supplement is alleged to treat. There’s some oddities in there: some supplements appear multiple times, depending on what the evidence is actually for, and there’s the implicit assumption that all the studies are of equal quality (Vitamin C for example is below the ‘worth it’ line, but nearly all studies look at the RDA which prevents scurvy but little else and not the mega doses people like Linus Pauling got excited about). Slightly more weirdly, the size of the bubbles reflects the popularity of the supplement on Google, which I find a bit meaningless. The number of papers or studies would be a better metric, I feel. But what’s really striking is how many are below the ‘worth it’ line, compared with the size of the supplement industry. Snake oil still sells. Talking of controversial subjects, don’t forget to check out the furore surrounding Medical Hypotheses. Just to remind you, the journal’s publisher, Elsevier, want to make MH a peer-reviewed journal, which would effectively destroy its raison d’être. Get the full story and have your say on our main site. And finally…it’s competition time! Following on from the success of our last Twitter competition, in which I asked people to summarize a published paper in a tweet, I’d like you to bare the deepest secrets of your soul and tell us the most embarrassing lab- or science-related blunder you’ve ever made (or witnessed). Just to make you feel better about telling the whole world about your most shameful episodes, take comfort that it’s not likely to be in the same league as NASA’s infamous goof with the Mars Climate Orbiter (unless there are any NASA scientists reading this, in which case the joke’s on you). The prize will be a bag of F1000 swag, awarded to whoever makes me laugh the hardest. Don’t forget to tag your posts with #scifubar. A few weeks ago I went to the Faraday Prize Lecture at the Royal Society. The lecture, The secret mathematicians, was given by the Charles Simonyi Professor for the Public Understanding of Science Marcus du Sautoy. Du Sautoy talked about five artists, how they were inspired by mathematics, and how their art tells us things about mathematics: a musician (Olivier Messiaen); an author (Luis Jorge Borges); an architect (Le Corbusier); a painter (Salvador Dali) and a choreographer (Rudolf Laban). For me, the link between mathematics and music breaks down when composers take the maths and try to base music on it, without reference to several hundred years of music theory. In other words, just because you can use (for example) prime numbers to create a pattern, doesn’t mean you should. Schoenberg’s atonal compositions just sound like noise to me—yes, call me a Philistine if you like—and I reckon you should leave prime numbers to the cicadas. Mathematics can describe all music, sure; but not all maths is musical. designed to deliver scientific knowledge and philosophy in musical form. Back to du Sautoy. In a three-dimensional development of da Vinci’s Vitruvian Man, the choreographer Rudolf Laban claims that Man is inclined to follow the connecting lines of the 12 corner points of an icosahedron with his movements travelling as it were along an invisible network of paths; and indeed his dancers trace out a Platonic shape with the tips of their limbs. But whether the maths drives this, or whether the mathematical description is simply an inevitable consequence of our bodily shape is not clear. The Fibonacci series is very familiar to most scientists, and perhaps because it is the result of a simple geometric algorithm it describes many natural relationships: the expanding population of rabbits, for example, or the spiral shape of a snail’s shell. Architects such as Le Corbusier have used it to plan buildings in two and three dimensions, and even the Greeks knew about it: the proportions of the Acropolis follow the Golden Ratio, which is derived from the Fibonacci sequence. Literature can also take inspiration from mathematics—not simply in the number of words or letters or syllables (although that is something that has occurred to this writer)—but in the inspiration of Borges’ Library of Babel. Borges, amazingly, uses a literary device to describe one model of the Universe: finite, yet unbounded (as opposed to spatially infinite but ‘flat’). 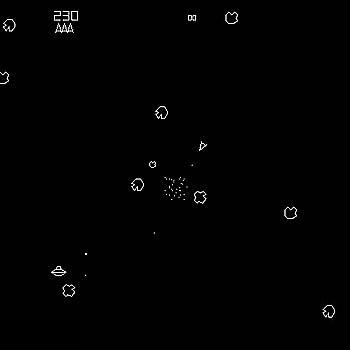 Du Sautoy took the opportunity in his lecture to show how a simple computer game could also model the Universe, which caused not a little hilarity and some reflections on the nature of dimensionality. 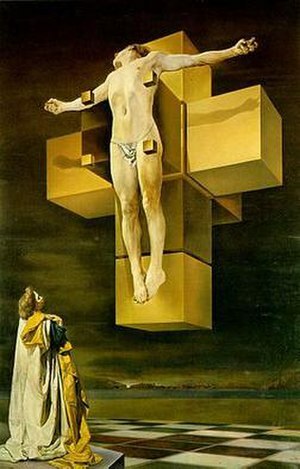 Christ floats above the exploded tesseract or hypercube (a three dimensional representation of a four dimensional shape); Dali uses a very mathematical and indeed scientific construct to explore how spirituality extends beyond the dimensions and senses normally available to us. Mathematicians, says Marcus du Sautoy, do it for the beauty, for the art. There is a pleasure in counting, in numbers; and in their relationships to each other. Perhaps then it is not surprising that art and maths do have a great deal to say to each other. The Michael Faraday Prize Lecture is available from the Royal Society website. Sarah Greene, publishing and new media entrepreneur, is to become Editor-in-Chief of The Scientist magazine. Sarah brings 25 years’ experience and strong editorial, business and leadership skills to this high profile appointment, and an unparalleled depth of specialist knowledge in biology and medicine. Sarah most recently cofounded and was Managing Editor at the Journal of Participatory Medicine, a revolutionary Open Access journal seeking to transform the culture of medicine. Her previous appointments include Director of Online Health at the New York Times, President of Praxis Press and founder and publisher of Current Protocols and HMS Beagle. Sarah takes over from Richard Gallagher at the helm of The Scientist. Richard described his seven years in the role as “enjoyable and fulfilling” and said it is “the best job in science publishing”. He is moving to head up a new Custom Publishing unit for The Scientist. The Scientist, the leading professional magazine for life scientists, publishes reviews of hot papers, the latest information on research, technology updates and careers as well as profiles of scientists to watch. The Scientist also publishes the greatly anticipated “Best Places” survey series. Sarah’s new role will include strengthening The Scientist’s online presence and overseeing closer ties with Faculty of 1000, the popular and respected international post-publication peer review service.